The Intercultural Community Center (ICC) is a space for students to meet, take part in discussions, or simply study. Our trainings and events center around the areas of equity, inclusion, and diversity. The ICC is a co-curricular programming, training, and research office committed to engaging broadly around diversity. 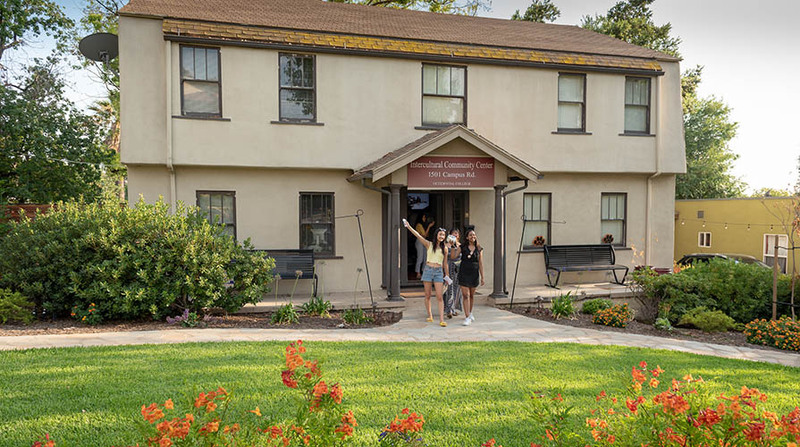 Working with all members of the Occidental community, it helps to ensure that both programming and policy are creating a campus climate that embodies inclusive excellence. The ICC is an evolving space that strives to be the location on campus where thoughtful thinking on race and gender can take place. Right behind the Hameetman Science Center, the ICC is open Monday-Thursday from 9am-10pm, and Sunday from 1:30-10pm so that students have a place to feel safe and secure. Stop by to hang out and enjoy the comfortable couches, large backyard, grab a snack, and do some homework! Students are always welcome to drop-in. The upstairs conference rooms can be reserved for meetings, discussions, group projects, and studying. The ICC is a safe space, and we have staff on hand to discuss issues of concern, as well as to provide resources and support for all students. Our professional staff is here from Monday - Friday, 9:30 a.m. - 5 p.m. If you'd like to meet with a professional staff member, please email ICC to schedule an appointment. Our student staff is here from Sunday - Thursday, 1:30 p.m. - 10 p.m.
Just far enough off campus to feel like you can get away, yet just close enough to make us really easy to find. We are located at 1501 Campus Road, on the corner of Campus Road and Armadale. If you're coming from campus, just take the road that goes behind the library, near Hameetman Science Center. Find a campus map.